Figure 6-33. 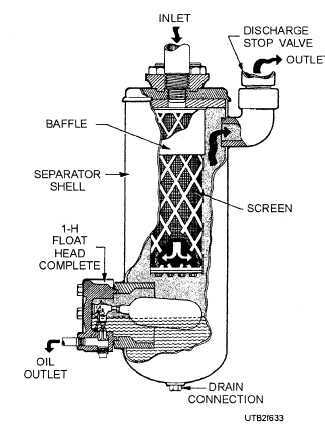 - A cutaway view of an oil separator. Refrigerants are fluids that change their state upon the application or removal of heat within a system and, in this act of change, absorb or release heat to or from an area or substance. Many different fluids are used as refrigerants. In recent years, the most common has been air, water, ammonia, sulfur dioxide, carbon dioxide, and methylchloride. Today, there are three specific types of refrigerants used in refrigeration and air-conditioning systems - ( 1) Chlorofluorocarbons or CFCs, such as R-11, R-12, and R-114; (2) Hydrochlorofluorocarbons or HCFCs, such as R-22 or R-123; and (3) Hydrofluorocarbons or HFCs, such as R-134a. All these refrigerants are "halogenated," which means they contain chlorine, fluorine, bromine, astatine, or iodine. Refrigerants, such as Dichlorodifluoromethane (R-12), Monochlorodifluoromethane (R-22), and Refrigerant 502 (R-502), are called PRIMARY REFRIGERANTS because each one changes its state upon the application or absorption of heat, and, in this act of change, absorbs and extracts heat from the area or substance. The primary refrigerant is so termed because it acts directly upon the area or substance, although it may be enclosed within a system. For a primary refrigerant to cool, it must be placed in a closed system in which it can be controlled by the pressure imposed upon it. The refrigerant can then absorb at the temperature ranges desired. If a primary refrigerant were used without being controlled, it would absorb heat from most perishables and freeze them solid. SECONDARY REFRIGERANTS are substances, such as air, water, or brine. Though hot refrigerants in themselves, they have been cooled by the primary refrigeration system; they pass over and around the areas and substances to be cooled; and they are returned with their heat load to the primary refrigeration system. Secondary refrigerants pay off where the cooling effect must be moved over a long distance and gastight lines cost too much. Refrigerants are classified into groups. The National Refrigeration Safety Code catalogs all refrigerants into three groups - Group I - safest of the refrigerants, such as R-12, R-22, and R-502; Group II - toxic and somewhat flammable, such as R-40 (Methyl chloride) and R-764 (Sulfur dioxide); Group III - flammable refrigerants, such as R-170 (Ethane) and R-290 (Propane). Dichlorodifluoromethane, commonly referred to as R-12, is colorless and odorless in concentrations of less than 20 percent by volume in air. In higher concentrations, its odor resembles that of carbon tetrachloride. It is nontoxic, noncorrosive, nonflammable, and has a boiling point of -21.7F (-29C) at atmospheric pressure. Because of its low-boiling point at atmospheric pressure, it prevents liquid R12 from contacting the eyes because of the possibility of freezing.